Lyle: Now try that against the jam track. 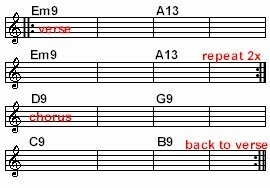 Lyle: Here's a TAB for the whole verse rhythm riff. 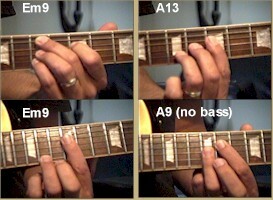 On any of these TAB's you may want to click the loop button to help play along, or just play along to the jam track! toya: I was trying Emin pentatonic licks between the chords. Will that work also? zz: Could we use F# Phrygian? toya: Ah, that's great. It shows the intervals also. Lyle: Yes you could use F# Phrygian. Lyle: That's it, but much faster. 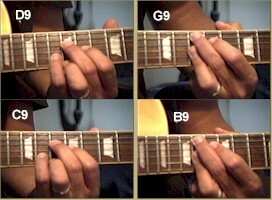 Lyle: Since both chords are in the key of D major, you can use the D major scale too! Lyle: It's true and I slaved over this tune for a couple weeks getting it to sound right for me. Picky: How do you chose your beginning and ending notes? Lyle: I just choose any of the notes in the scale to start on and end on, if it doesn't sound good, I try not to do that again, I'll use a different note. Lyle: You've been working on the "verse" section of the jam, now let's learn the chorus section. Lyle: Got your hands full I bet. Lyle: Thanks, glad you like it. Lyle: The solo is over the whole verse and chorus. Watch and listen to it on the virtual neck. Notice how close it is the scale options. You'll also notice it sliding up to different notes. Lyle: You can find little riffs inside the whole solo that you like and learn pieces of it at a time. Lyle: The video is uploading to you now. Lyle: Here's the original song I wrote and recorded years ago. It features my guitar synth playing all the solos. Even the electric piano solo is me playing my midi guitar. I constructed the whole song and played all the parts from my midi guitar.